I've had this dead flashlight lying around in my shop for a few months, and I decided that it was time for it to live again! Step 6: Reassemble the flashlight. The rubber handle was glued in place, but since this flashlight was a few years old, the glue was brittle and the handle peeled right off. After that, it was just a case of prying the light open. Afterwards, I used a power drill to clean out the insulating material out of the base. Remember TO USE SAFETY GLASSES! There will still be bits of glass in the socket. I will use a non conducting epoxy later to replace what I've removed. Now then, since the next highest resistor is 54Ohms(Always go up in resistors, never down), we will use this value for the next step, Calculating the equivalent resistance for three LEDs in parallel! This is by far the easiest part. When you have to calculate an equivalent resistance (Req)for three LEDs in parallel, all you need to do is take your resistance (R) from step one, and divide it by the number of LEDs (n LED for this instructable) you intend to use. Req= 18 Ohms! Easy peasy! Just a quick note about LEDs. LEDs have a polarity, The long lead is the positive, the short one is negative. If you've already snipped your LED leads, you can also tell which one is the short (negative)by looking at the base of the "bulb". One side of the base has a flat spot. The negative lead is the same side as the flat spot . Here you can see that I have soldered the like polarities together, and I wrapped and soldered the 18 Ohm resistor (this is the negative end). The other three leads will be soldered to the bulb socket. Insert the resistor/ LED assembly into the socket, so that the reisistor lead pokes out of the bottom of the base. Solder the resistor lead and then solder each of the remaining leads to the top of the socket. After the soldering was done and the socket had cooled, I mixed a bit of Aves Apoxie Sculpt (Oh, that wonderful Aves!) and pressed it into the voids around the resistor. Aves is a non conductive two part epoxie that scale and figure modellers use for sculpting. You could just as easily use epoxy glue, I just had the Aves on hand. Put the new and improved bulb back in the light, and reassemble. I used Methylene Chloride (AKA liquid glue) to glue the rubber grip back onto the flashlight body, and I put fresh batteries in while I was at it. To the casual observer, it looks like any other el-cheapo flshlight. The only clue to its true nature is found by looking right at the bulb. He lets out a girlish squeal (think nine years old, with pigtails), and laments,"Why is this thing so bright!" Hopefully you've all found this instructable entertaining and educational. Happy hacking! Dude your math boggled my brain. Could you please make it a little dumber?? I do not know anything about bat159, and I hope that he/she doesn't think I'm trying to disrespect him/her, but I think that may be the case here. bat159 is so used to thinking within this paradigm, that he/she often forgets that the rest of us do not think that way & hence, do not understand a lot about LED's, or in my case, I do not understand a lot about electronics in general....but thanks to him/her taking the time, I think I understand now about LED's. You sir are correct! I've been playing with/ working with electricity/electronics for about 40 years now. Sometimes I have to step back and think about an alternate explanation when I'm talking about it to someone who isn't familiar with the little invisible things running around in the wires. By the way, are you familiar with the theory that all things electronic run on SMOKE. It says that if you let the smoke out, the electronics quit working.!! 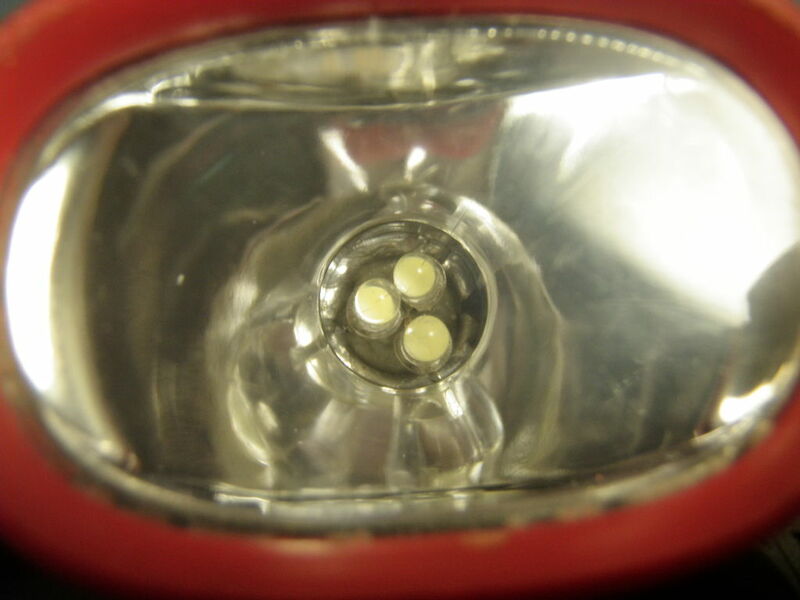 If you use the same LED's that db used you will not need a resistor, however , the LED's will not be as bright. His LED's are 3.6v and your batteries will only produce 3 volts. To calculate the resistance that you would need for another flashlight, first take the number of batteries that it uses (AA,AAA,C, or D cells) and multiply by 1.5. A 2 cell light would be 3 volt a 3 cell light 4.5 volt and so on This is Vs (Voltage @ supply). The second thing that you will look for on the spec sheet is the current drawn by the LED. This will normally be abbreviated as "I", and will be rated as either a whole number ie 20 mA (20 milliamp) or as a decimal value 0.02 A (0.02 Amp). Both mean the same thing 20 thousandths of an amp of current for each LED you use. There are two basic ways to wire something electrically series and parallel. Wiring in series Voltage drops add and current stays constant. In parallel wiring, currents add and voltage drops stay constant. We are going to assume that the flashlight we are using holds 3 D cell batteries, and the bulb will be replaced by 3 LED's, each of which has a 3.6 Vf and uses 20mA of current. We will have our batteries in series (normal for a flashlight) and our LED's will be wired in parallel. To calculate the Ohm value of the resistor we use the formula R=V/I (resistance = voltage /current) so R=0.9/0.060 or 15 Ohms. Resistors come in regular wattage ratings of 1/8w,1/4w, or 1/2w, and larger. So we would need a 15 Ohm, 1/8 watt resistor. Unfortunately Radio Shack only lists a 15 Ohm 1/4watt (catalog # 55049354) on their web site for $1.44. As long as the resistance is correct the wattage can be any size greater than you need and it will work fine. So if I have 4 batteries in the flashlight, and I want to convert it to LED, I need to add up the voltage and the watts of the LED's until the volts & watts of the LED's match the volts & watts of the batteries....is this correct? Think of the watts as the amount of heat that each device gives off as it uses its share of the volts. With the small amount of power that this circuit uses we can actually ignore the watt factor, I just threw it in for completeness. The batteries are your supply and don't have a watt rating since they don't use any power themselves, they just supply it to everything else. What we want to do is to get the total voltage that the LED's and the resistor uses to match the voltage supply from the batteries. If you are using 3.6 volt led's subtract the led voltage from the battery voltage 6-3.6= 2.4. The 2.4 is the voltage the resistor has to use. but I'll copy/paste this just to make sure I don't forget....which I'm good at(forgetting things). Bat159, TY very much Sir for taking the time to explain all this to my feeble mind...much appreciated. This sounds cool as all get out, but you lost me after step #3. With the room you have in the case, could a voltage/current regulating circuit (maybe a zener diode based unit) be installed? My understanding is that batteries are useful down to .8 volts per cell. That would allow us to put 4 cells with a start voltage of 6 volts and it would drop to 3.2 volts. That would allow keep LEDs lit from full charge down to useless. I realize you have 3 batteries in this one but the regulator would work for a variety of input voltages. Perfect, I have a few dead lights kicking around, was going to replace bulbs anyway! Good project to do with my 11yr old Daughter. How much longer will batteries last over incandescent? Hem, I can't say for sure how much longer it will last, but it will be considerably longer with the LEDs, as they have a very low current draw. I'm glad that you find that this will make a good project for you and your daughter, make sure to document it and post it here afterwards! Electrical or other tape around the bulb works better than paper towel. If you heat the bulb base the epoxy/glue will melt and you can free the bulb in one piece in many cases. Most excellent work. Good use of stuff on-hand... like cheese & bread. Nicely done. I went the other way around when I upgraded my xenon headlamps. It just had the 2 AA batteries so I did a joule-thief as a driver circuit for it to work.